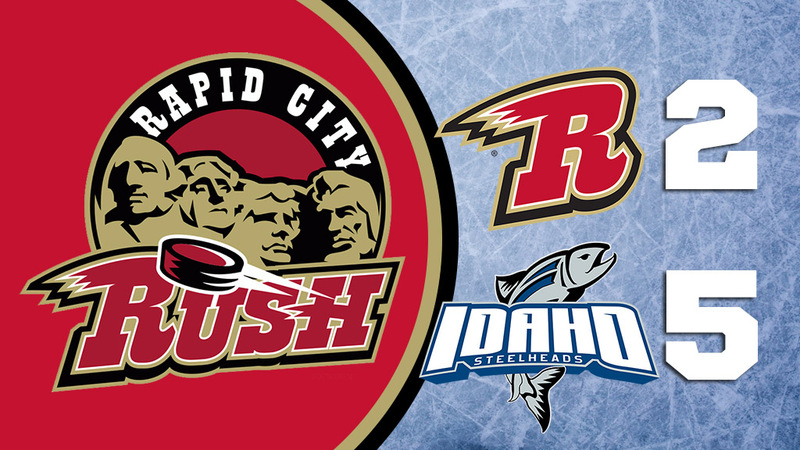 The Rapid City Rush ended their season series with the Idaho Steelheads with a light roster but fought until the final horn as they continued to look at building a stronger lines for the 2018-19 season. BOISE, ID — The Rapid City Rush ended their season series with the Idaho Steelheads with a light roster but fought until the final horn as they continued to look at building a stronger lines for the 2018-19 season. The Steelheads are continuing to ramp up their post-season and keep pace to ensure that home-ice advantage in the 1st round. Keeping the pressure on Rush netminder Christian Frey Idaho was able to get the game’s first tally yet again. Will Merchant pocketed his 17th goal of the season at 8:05 of the 1st period, corralling the puck in the Rush zone and blasting a shot by Frey for the 1-0 edge. The Rush would answer before the first intermission and break their scoreless streak against Steelheads netminder Tomas Sholl. Taking the draw in the Idaho zone Peter Sivak took the puck to the left-wing side and rifled a shot by Sholl to square the game at 1-1 with 5:44 remaining in the period. Idaho ramped up the tempo in the middle frame, pocketing a pair of goals early on to out-pace Rapid City. Eric Sweetman broke the deadlock just 1:39 into the period, driving the puck from the Rush attacking zone into their own before zipping a wrister by Frey for the 2-1 edge. Idaho doubled their lead moments later at the five minute mark when Cole Ully and Jefferson Dahl found themselves in a 2-on-1 driving into the Rush zone. Ully ripped the puck over Frey’s shoulder to put the Steelheads up 3-1. That score would hold heading into the final frame with the Steelheads holding a 15-to-8 edge in shots-on-goal and neither team was able to cash-in on their powerplay opportunities. Rapid City, shorthanded and only fielding 13 skaters on their roster to Idaho’s 16, didn’t give up though. Working on a powerplay due to a penalty to Charlie Dodero, the Rush pulled within one goal when Andrew Radjenovic buried the puck from the slot with 6:32 left in the game. That would be as close as the Rush would get as Idaho pulled away for good with a pair of goals from Steven McParland and Ully with less than two minutes in regulation for the 5-2 final, including the final one being awarded as an empty-netter. The Steelheads outshot the Rush 26-to-16 and went 0-for-1 on the powerplay while the Rush were able to cash-in going 1-for-3 while on the man-advantage. Tomas Sholl gets the sweep against the Rush to end the weekend series, stopping 14-of-16 shots on the night while Christian Frey takes the loss stopping 21-of-25 shots faced. With the win the Steelheads hold a 13-point edge over the Wichita Thunder and have locked in the #2 seed in the Mountain Division. They are 7-points behind the Colorado Eagles and still have an outside shot at locking up the #1 seed in the division. Rapid City Rush: The Rush return home for their final two games of the regulation season from the Rushmore Plaza Civic Center Ice Arena. They will face off against the Quad City Mallards with puck-drop for Friday night’s contest slated for 7:05pm MT. This game will also feature retiring Danny Battochio’s #30 to the rafters. Idaho Steelheads: Idaho will host the Utah Grizzlies for a 2-game tilt Friday and Saturday. Friday night’s game is slated for a 7:10pm MT from the CenturyLink Arena.